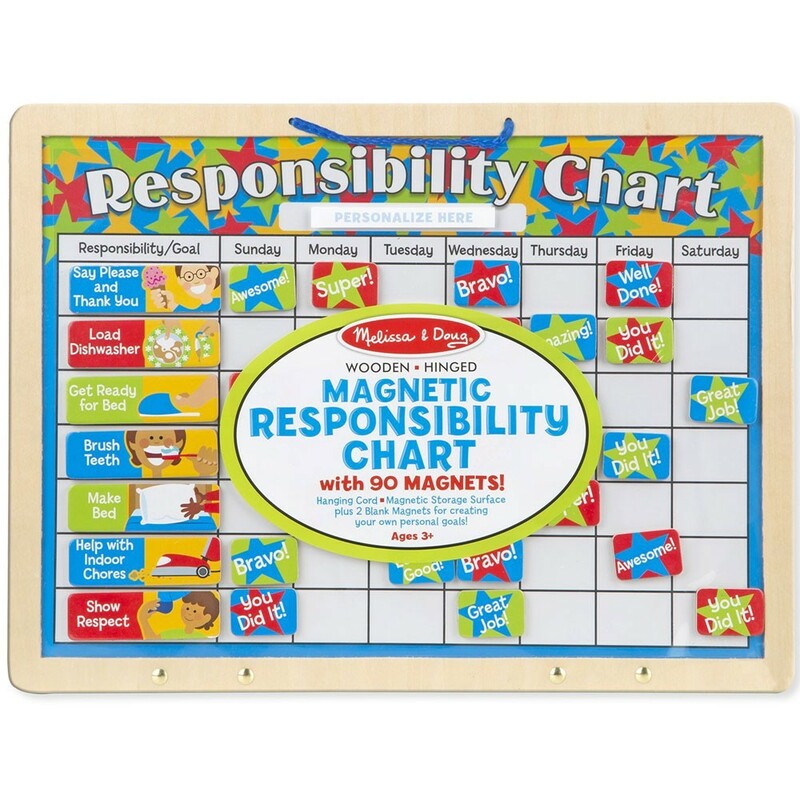 Melissa & Doug's Magnetic Responsibility Chart is easy for children to understand, suitable for all ages, offering a variety of chores and positive behaviors on magnetic pieces that kids love. A true bestseller! With Melissa & Doug's new edition of the super popular Magnetic Responsibility Chart encourage independence, watch your kids blossom into cheerful workers, reward performance, and get a little help around the house! Why do we love this neat chart? Because it works! This wooden toy is easy for children to understand (excellent for non-readers), suitable for all ages, offering a variety of chores and positive behaviors on magnetic pieces that kids love. 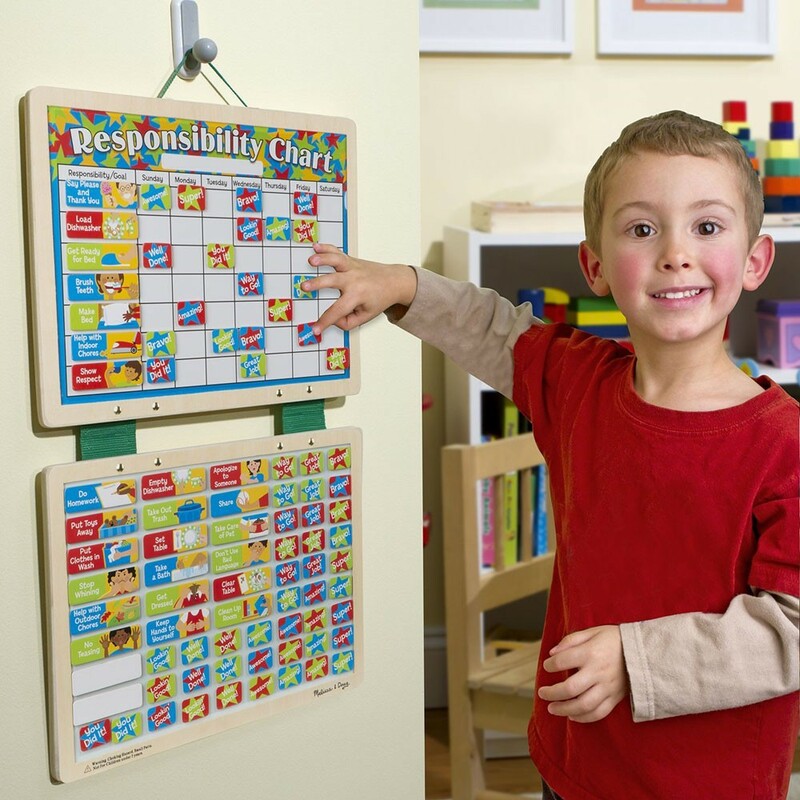 This Magnetic Responsibility Chart includes 89 wooden strong magnetic pieces (2 blank pieces for personalizing). A dry erase surface adds to its versatility. Exciting enough to send your kids racing to choose a favorite reward! The list of chore and behavior magnets include: brush teeth, get dressed, put clothes in wash, clean up room, do homework, set table, and many more. The reward magnets include: 'Awesome', 'You Did It! ', 'Amazing', 'Way to Go! ', and others. This life skills teaching toy is made from high quality wood. All kids-including those with mild or profound disabilities-benefit from experiences with chores. Dimensions of package 15.6" x 0.9" x 11.7"
Write your own review of Magnetic Responsibility Chart with 89 Magnets. Rating: 5 Cool chart by Jessica G This is a great way to foster independence and a sense of responsibility. It is also a great way to practice social skills and even motor skills for smaller children. You can also work on color recognition, days of the week, reading or pre-literacy skills and even counting and math. 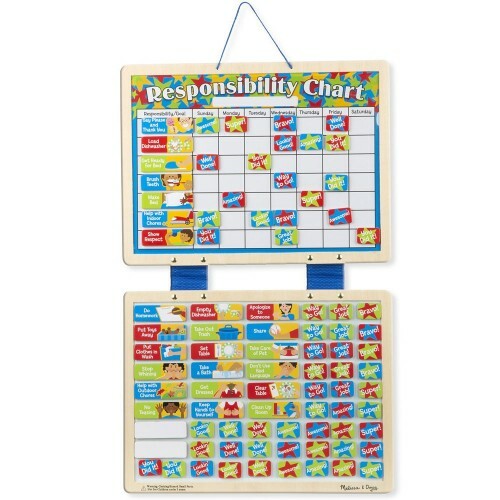 This is a multi-faceted, easy to use chart and is durable and high quality just like all Melissa and Doug toys. Rating: 5 by David, NJ great toy teaching organizational skills. good quality and presentation. Rating: 5 by Diane, WY it is a Christmas gift for my grandson. I think it will be a great learning tool as well as a fun activity.